Spiridione Grossi, a photographer from Liverpool, devised an apparatus which took six small photographic portraits on a narrow strip of photo-paper. These small photos were nicknamed "Sticky Backs". For a short period between 1910 and 1911, Spiridione Grossi operated a Sticky Backs Photo Studio at 54 North Street, Brighton. Abraham Dudkin, a Brighton-based furrier, took over ownership of Spiridione Grossi's Sticky Backs Photo Studio at 54 North Street, Brighton around 1912. Abraham Dudkin continued to produce "Sticky Backs" in Brighton between 1911 and 1915. Dudkin opened a number of branch studios between 1915 and 1920. 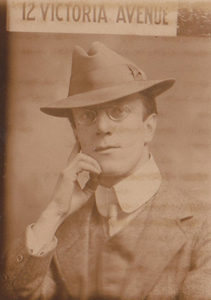 Sidney Boultwood, a former music hall artist, took up photography in his late twenties. Around 1911, Sidney Boultwood opened a "Stickybacks" photographic portrait studio at 12 Victoria Avenue, Southend-on-Sea. Between 1911 and 1918, Sidney Boultwood operated over a dozen "Stickybacks" studios in various English towns. 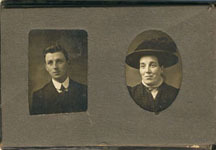 Paul Trott inherited from his mother a very small photograph album which contained 23 tiny photos of family members, most of which were taken at the "Sticky Backs" studio at 54 North Street, Brighton between 1910 and 1914. Between 1912 and 1915, 'automatic photographs' were being taken in a number of Sussex seaside towns, including Bognor, Brighton and Worthing. Anatol Josephewitz (Josepho), a Russian Jew from Siberia, trained as a portrait photographer in the German city of Berlin. Between 1912 and 1925, Anatol Josepho operated as a portrait photographer in Budapest, Shanghai and New York. Josepho conceived the idea of an "automatic camera" and in 1925 he invented the Photomaton automatic photo booth. During the 1930s, Photoweigh machines (which weighed a sitter while an automatic portrait photograph was taken) were installed in several seaside towns. The Photoweigh machine on Brighton's Palace Pier was in operation between 1933 and 1972. [ABOVE] A strip of photobooth photos showing my brother John Simkin with his wife-to-be Judith 'Julie' Harris (c1965). John Simkin married Judith Harris in Romford, Essex, in 1966. [ABOVE] My sister, then Patricia (Tricia) Simkin, now Mrs Pat Woods, photo-graphed in East Ham, East London, in September 1960 when she was 18 years of age. Tricia married James (Jim) Woods in Ilford, Essex, in 1963. In 2013, Tricia and Jim celebrated 50 years of marriage. 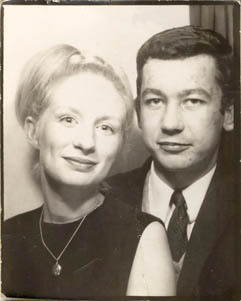 [ABOVE] My brother John Simkin with his wife-to-be Judith 'Julie' Harris (c1965). John Simkin married 'Julie' Harris in 1966. Judith Simkin died in 2009 after 42 years of marriage. 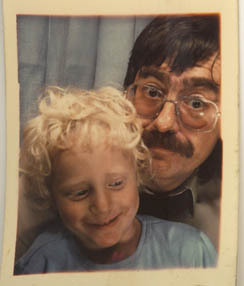 [ABOVE] Me (David Simkin) photographed in a photobooth with my son Kieran in 1987. Kieran David Simkin was born in Brighton, Sussex, on 9th July 1985. The automatic photographs of father and son were not entirely successful as I had failed to raise the adjustable seat to a suitable height. 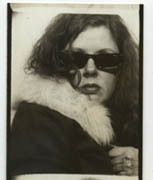 [BELOW] I was more successful in a photo-booth the following year. Kieran and me both manage a smile for the automatic camera and this time we are actually seated at the right level. [ABOVE] David Simkin (me) in the unconvincing guise of a hardened criminal. This simulated mugshot photograph was taken in a photobooth in the West Midlands town of Walsall on 19th October 1974. I was, at the time, a student teacher in my final year at West Midlands College of Education. I was in possession of a Teaching Certificate and I was working towards a Bachelor of Education degree, my main subject being Art & Design. 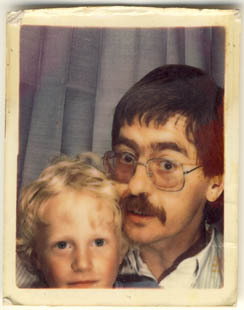 The 'mugshot' photo was to be used in an artwork which explored the theme of childhood innocence and adult criminality. The proposed artwork was inspired by two contrasting portraits of John McVicar, one, a photo of an innocent looking school boy, the other, a photograph taken when the supposedly hardened criminal was in custody after being arrested for armed robbery. My stepfather, Bill Simkin, albeit unconsciously, presented a more believable visage of a career criminal than I did myself when he posed for his bus pass identity photograph in a Romford coin-operated photobooth. 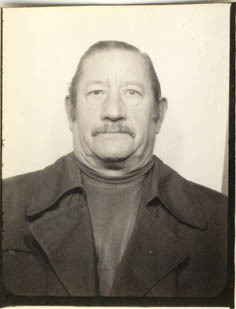 [ABOVE] My late step-father William ('Bill') Simkin, photographed for his bus pass (c1980). Bill Simkin was the younger brother of my real father, John Edward ('Ted') Simkin. Bill Simkin's first wife, Winnie, died in 1968. Two years later, Bill married my mother. 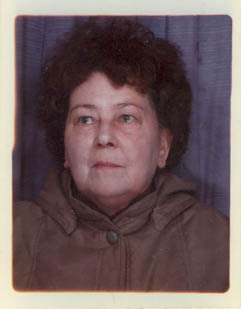 [ABOVE] My late mum, Muriel Simkin, photographed for her bus pass (c1980). Muriel was widowed in 1956 when her first husband, John Edward ('Ted') Simkin, was killed in a road accident. She married Ted Simkin's younger brother, Bill Simkin, in 1970. [ABOVE] Changes in hairstyle and eyewear over a period of 35 years, as recorded in formal photographs taken between 1964, when I was a 15 year old schoolboy, and 1999, when I was photographed for an identity card. The school photograph is not, strictly speaking, the product of an automatic camera, but it is just as impersonal as the photobooth photo. 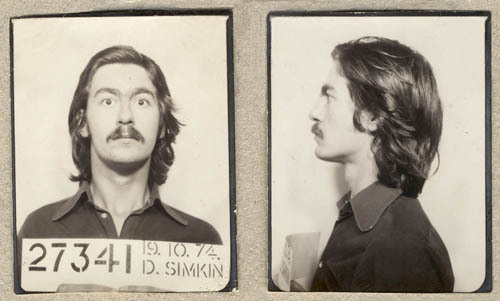 [ABOVE] A strip of photobooth photos showing me (David Simkin) in my student days (19th October 1974). The fake mug-shot photos were produced for an artwork on the theme of innocence and criminality. [BELOW] A heavily watermarked passport photograph (January 2010). After a "life sentence" of 36 years, I produced a more convincing mugshot when I posed for a passport photograph in a Photo-Me booth in the lobby of a Brighton branch of Sainsburys Supermarket in 2010.